Do you know a teen or young adult who isn’t tied to their mobile phone? According to Pew Research, 80% of 18-34 year olds own a smartphone – and they’re all using them a lot. If you want your brand to appeal to this audience, implementing an effective mobile marketing strategy is the way to go. But how do you capture the attention of individuals who are always on the go? A good start would be to capitalize on the channels that they always access on their mobile devices. When it comes to mobile marketing, social media is the top channel to reach millennials. Make sure that your social media strategy translates from desktop to mobile; since the layout space for mobile devices are smaller and more compressed, less text and more pictures and graphics can garner more attention and interest from millennials. Promote your brand by sharing relevant yet fun videos and photos on social media networks like Instagram, Pinterest and Twitter. Other social sharing sites most appealing to the younger generation include Snapchatand Vine. 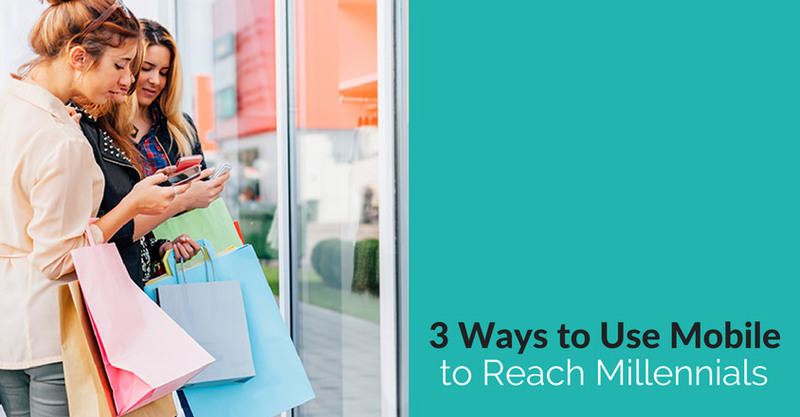 Millennials love to shop on their mobiles, so use email to promote coupons and showcase products. Announce contests and sweeps via mobile, and promote upcoming events. Another option is to collaborate with email deal providers like Groupon and LivingSocial to promote your product or service for you, or barter emails with other like-minded companies to get in front of a new audience. 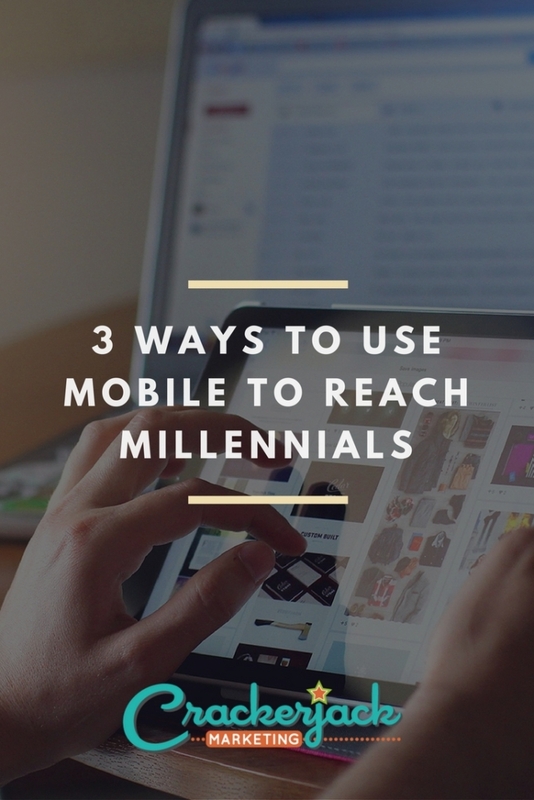 Be aware that millennials will delete emails that are not optimized for mobile devices – and make sure that the click-through experience is also optimized for mobile. Millennials absolutely love apps; they use them for many purposes, which include entertainment and gaming, social networking, online shopping, and utilities. One type of app that is proving to be a hit to the younger crowd is instant messaging. This type of apps pose a huge potential when it comes to advertising your brands, because millennials relish the idea of being able to instantly connect with their friends. The immense popularity of this platform convinced Facebook to acquire instant messaging service Whatsapp for an eye-popping $19 billion. Despite critics calling it as one of the most lopsided deals in internet history and other pundits expecting an eventual bust, Facebook believes the acquisition will be worth every penny as they express optimism the number of Whatsapp users will surge to 1 billion within the next few years. Another effective way of integrating apps into your mobile marketing scheme is to leverage television advertisements to drive mobile engagement as explained in this MediaPost article by Eddie DeGuia. Should you create your own, branded app? It depends on whether you have enough content to keep it interesting and active. Otherwise find ways to use existing apps, including social networks and text messaging apps. 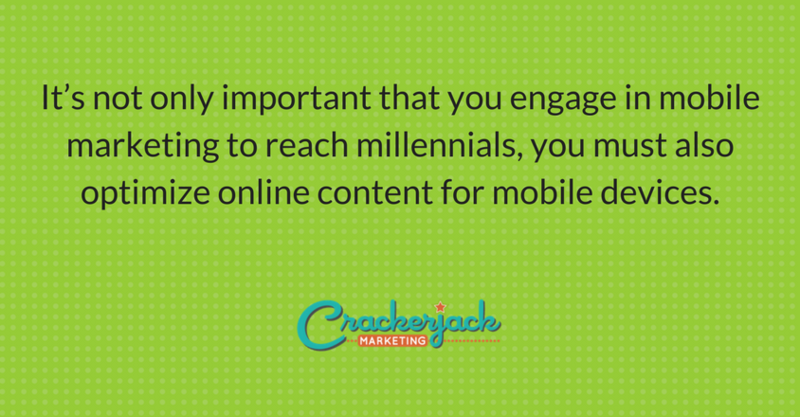 It’s not only important that you engage in mobile marketing to reach millennials, you must also optimize online content for mobile devices. And keep your eyes and ears open for the next new thing, it’s likely millennials got there first. What other mobile platforms do you use to reach out to millennials? Let us know in the comments below! Is Your CEO Fluent in Social? How Can I Create an Effective Social Media Profile?